Please call if your city is not listed or for land only prices. 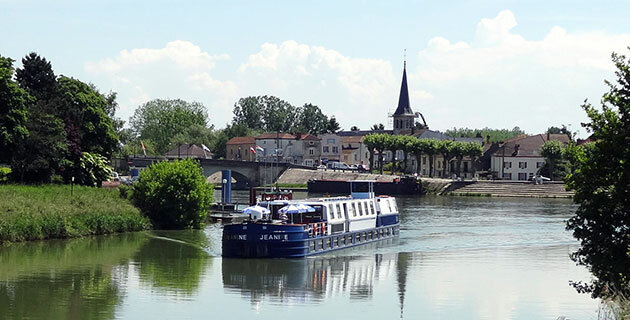 Prices are per person based on double occupancy and include airline taxes, surcharges, and fees of $684, which are subject to change until final payment is made. Dating to 1914, the 140-room La Tour Hassan represents Rabat’s last surviving hotel to be constructed using traditional Moorish-Andalusian design. The citadel-style hotel stands inside a fortress wall at the center of the city and features three restaurants, one bar, Internet access, laundry service, fitness center with Jacuzzi, sauna, solarium, and outdoor pool. Air-conditioned rooms have private bath with hair dryer, in-room safe, mini-bar, TV, and phone. Opened in 2014, Hotel Sahrai is a contemporary hotel located on the southern hills overlooking the Fez medina, and a short drive from this UNESCO World Heritage Site. Designed to resemble the architectural layout of the medina, the 50-room boutique hotel features a restaurant and bar, fitness center, Jacuzzi, spa with massage treatments, sauna, steam room, outdoor pool, tennis court, terrace, and laundry and dry cleaning services. Air-conditioned guest rooms offer private bath with hair dryer, complimentary Wi-Fi internet access, mini-bar, in-room safe, TV, and phone. 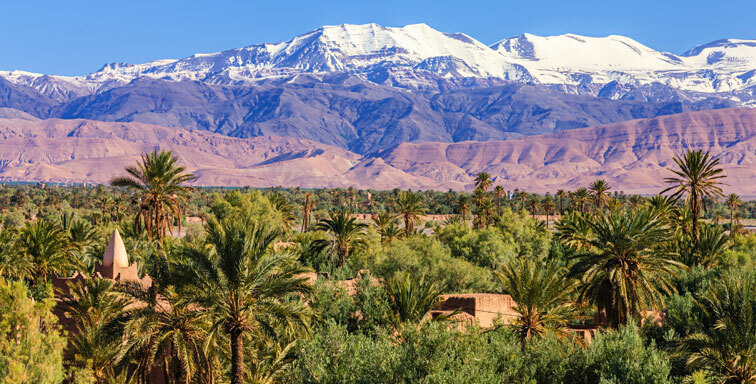 Set on the outskirts of the city of Erfoud, this 44-room kasbah-style hotel offers a traditional Moroccan desert setting surrounding a courtyard. The hotel features two restaurants and bar, complimentary Wi-Fi internet access, laundry/dry cleaning services, full spa, health center, and an outdoor swimming pool. Air-conditioned guest rooms have private bath with hairdryer, minibar, tea- and coffee-making facilities, TV, and phone. Please note that, while this hotel represents the best of accommodations in this somewhat remote region, you may find the level of quality and service here somewhat lower than at other sites on your tour. 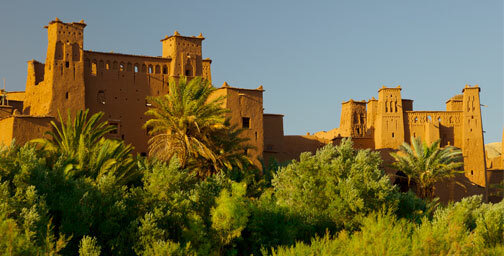 A traditional Moroccan-style hotel, the Berbere Palace offers guests a host of contemporary amenities including two restaurants, two bars, complimentary Wi-Fi internet access, laundry and dry cleaning services, fitness center, swimming pool, sauna, Turkish bath, tennis courts, terraced garden, and library. Air-conditioned guest rooms have private bath with hair dryer, mini-bar, TV, and phone. Sitting on the edge of the city at the foot of the High Atlas Mountains and within easy reach of the Medina and Jamma el Fna Square, the Sofitel boasts three restaurants and a bar; Internet access; laundry and dry cleaning services; ATM; fitness center with gym, Jacuzzi, sauna, and solarium; Turkish bath; and two outdoor pools. Air-conditioned guest rooms have private bath with hair dryer, terrace or balcony, in-room safe, mini-bar, TV, and phone. This 255-room hotel is conveniently situated in the center of Casablanca in United Nations Square, close to the Old Medina, Habous Quarter, and the central market. The hotel has multiple restaurants and lounges; spa; fitness center with sauna, steam room, and massage treatments; unheated outdoor swimming pool; squash courts and beach volleyball court; boutiques; and laundry and dry cleaning services. Air-conditioned guest rooms have private bath with hair dryer, in-room safe, mini-bar, TV, phone, and internet access. This brilliantly entertaining, insightful classic account of Marrakesh captures the rhythm and spirit of life in the alleyways of the Medina in the 1950s. This captivating memoir by one of Morocco’s most outspoken women opens, “I was born in a harem in 1940 in Fez, a ninth-century Moroccan city.” Mernissi captures not only the spirit of the place, but also the hierarchy and decorum of a Muslim family compound. History, religion, daily life, food, health and safety are all covered in this accessible pocket guide to Moroccan customs, etiquette and culture, by an author who lives and teaches there. 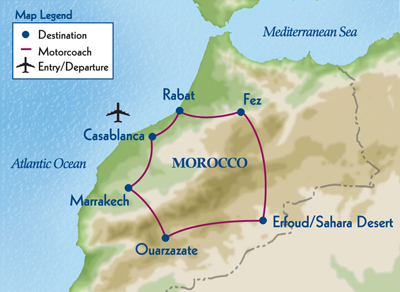 Gorgeously illustrated and filled with excellent maps, this compact guide introduces Morocco’s history, culture and attractions. A road map featuring city and town plans at a scale of 1:1,000,000. Two sides. 28 x 36 inches. This handy phrasebook includes pronunciation, basic grammar and essential vocabulary. A Mediterranean cuisine icon brings a lifetime of experience and taste to this gorgeously illustrated cookbook and cultural guide. First published in 1958, Madame Guinaudeau’s charming guide to Moroccan cuisine explores the rich culinary traditions of Fez with anecdotes, recipes, drawings and chapters on everything from choosing spices and preserving lemons to the art of making and drinking tea. Miller puts the history of Morocco from 1830-2000 into a global context in this incisive, readable survey. Wide-ranging, accessible and effectively condensed, this brief history marches confidently through the centuries, covering key events and personalities in Morocco, Tunisia and Algeria to 1999. Armstrong brings authority and experience to this vivid, clear-headed survey of the history and impact of Islam, from the birth of Mohammad to present-day challenges. A penetrating look at political, social and cultural life in Morocco under King Mohammed V, by a former New York Times correspondent. An elegant and scathingly honest history of Tangier’s golden age (1920s-1950s). In crisp prose and witty vignettes, Finlayson lays bare Tangier’s vices, virtues and the exploits of famous visitors including: Beat poets, heirs and heiresses, Tennessee Williams and Truman Capote. A handy, instructive guide to judging Persian rugs’ quality, origin and level of craftsmanship, useful for travelers, students, professionals and collectors alike. Splendid color photographs and aerial views of the palaces, mosques and signature walled gardens of Fez, Marrakech and Rabat. Clarke’s poignant, gorgeously illustrated, tale of restoring Riad Zany, a traditional courtyard house in the heart of the ancient city. Shah (The Caliph’s House) weaves his own family tradition of storytelling with commentary on Moroccan spiritual traditions, culture and history in this account of his adopted home on the sea in Casablanca. Wharton’s enjoyable account of her month-long journey through Morocco after WWI captures the landscapes, architecture and many aspects of Muslim culture and history with emphasis on the cities of Rabat, Fez and Marrakech. A classic account of the tribal warlords of the Atlas Mountains – and of life in French colonial Morocco. A rousing tale and excellent introduction to Marrakech. Traveling across the Sahara from Algiers to Dakar, Langeweische has written an uncommonly good memoir of the desert, with meditations on its history, inhabitants and allure. Set in Fez during a 1954 nationalist uprising, this richly descriptive novel may be the most evocative of Bowles’ many works based in Morocco. Originally published in 1955. A choice collection of travel writing on the Red City by 40 luminaries, including George Orwell, Winston Churchill, Gavin Maxwell and Peter Mayne. 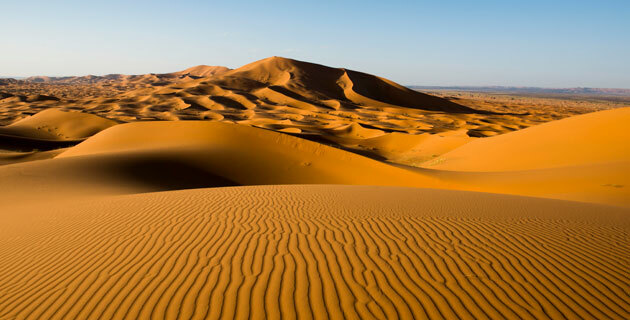 Bowles’ most famous work, by turns stark and transcendent, is a tale of three people whose lives unravel in the desert of North Africa. Originally published in 1949.